Legends also ascribe the foundation of the games at Isthmia variously to Poseidon, Sisyphos, and Attic tradition maintains that Theseus was responsible. 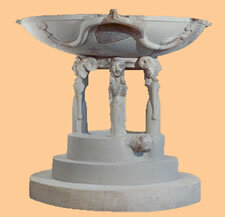 In any case, the games began around the time of Periander, the date usually given as 582BC, and they were held in the second and fourth year of each Olympiad. Corinth was in charge of them until its destruction in 146 BC, when Sikyon, took over, but they passed back to Corinth with the refounding of the city of Corinth by Julius Caesar. The Athenians originally had the place of honor and the Elians were excluded; the Romans were permitted to compete beginning in 288BC. The athletic contests resembled those at Olympia, to which Isthmia played a close second. In 336BC Alexander the Great ('Megasalexandhros' in Greek) was nominated leader of the Greeks against Persia; in 196BC Flaminius declared the independence of Greece; a proclamation echoed by Nero in 67AD. The excellent Museum, which is recommended for the first stop, stands at the top of a rise by the road. Open Tues-Sun; 8:30am-3pm;free-same hours as site. The first section is devoted to Isthmia itself, with amphorae (panathenaic type), athletic equipment, tiles and paintings from the Archaic temple. Next come finds from Kenchreai with panels of glass mosaic showing a harbor town. These were found in crates and may have been imported from Egypt. They were damaged in an ancient earthquake. 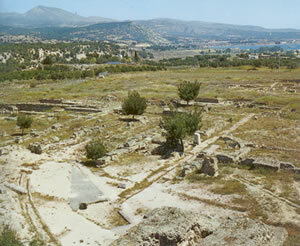 Kenchreai was the ancient port of Corinth on the Saronic Gulf. Traces, mainly Roman, of harbor installations remain under the water there. There are also wooden doors and scultpted ivory plaques with seated male figures in this section.